Rebalance Managing Director Scott Puritz, and author Morra Aarons-Mele, sat down with NPR journalist, John Ydstie, to discuss how Rebalance is transforming the investment industry through its unique combination of world-class financial experts and productivity-enhancing technology. The first thing to realize about financial advice is that it’s not free — and it often costs more than you think. That’s what Morra Aarons-Mele found when she decided to find a financial adviser after she inherited an IRA from her father. “I felt like I wanted an adviser because I was uncertain about — I never had any money before, frankly, and I really wanted to be a good steward of it,” Aarons-Mele says. She found an adviser who charged her a yearly fee of 1 percent of the value of the IRA. That’s pretty standard. But after receiving some quarterly reports, she started feeling uneasy about all the added fees. So in addition to paying her adviser 1 percent a year, Aarons-Mele was paying a lot to the managers of the mutual funds in her portfolio. The average U.S. mutual fund charges just under 1 percent in fees. That may sound like small change, but the impact can be truly dramatic. Over 30 years, paying 1 percent annually for advice and another 1 percent for your mutual funds could cut your retirement gains almost in half. So keeping fees much lower than average is critical, says Kate Fries, a retirement adviser at The Family Firm based in Bethesda, Md. Fries also charges 1 percent for her advice, but she’s all about keeping the other fees to a minimum. “The vast majority of the time, whether in an index fund or even more inexpensively via an ETF [exchange-traded fund], it should be well under a half a percent,” Fries says. An ETF is a basket of stocks traded like a single stock in the stock market. Of course, even paying close to 1.5 percent could cut significantly into your investment returns, so why not just invest on your own or in one of those cheap robo-advisers online? Fries argues it can be worth it to pay for a human adviser. She says they can help you work through how to organize your finances to achieve your goals, and when you’re ready, how to structure your retirement. And, she says, she protects her clients from themselves. “It’s really hard when the market is as volatile as it was this past August and to not knee-jerk react and decide, ‘Oh, gosh, is now the time to sell? I don’t want to lose everything,’ ” Fries says. But here’s the problem for the vast majority of Americans: They don’t have enough money to access Fries’ advice. Her firm requires a $600,000 minimum investment. There is a new model for providing less expensive advice being offered by a number of firms. An innovative firm called Rebalance uses a hybrid model that keeps costs low by combining human advisers on the phone and technology online. 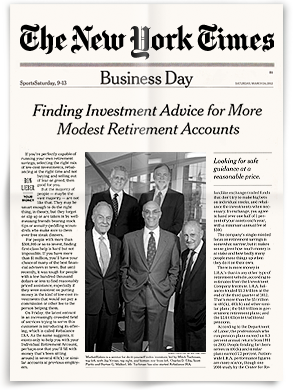 “Rebalance charges a half of 1 percent for retirement investment advice for our clients,” says Scott Puritz, a managing director for the firm. That’s half the cost of a traditional investment adviser. And Rebalance builds investment portfolios of index funds and ETFs that add just 0.2 percent to the fee. “So our clients experience an all-in, comprehensive cost of 0.7 percent per year,” Puritz says. But Rebalance’s minimum investment is $100,000, and Vanguard’s similar service requires a $50,000 minimum. That still excludes the majority of Americans. To fill that gap, a new network of financial planners has sprung up. It’s called the XY Planning Network. Cristina Guglielmetti of Future Perfect Planning is one of them. “We are all planners who are trying to deliver quality fiduciary financial planning services to clients who have traditionally been cut out of financial planning,” Guglielmetti says. Her clients are often younger people — freelancers, new parents and newlyweds merging their finances. Guglielmetti charges them $500 for an initial plan and about $100 a month to help them define goals, track expenses and begin investing for retirement. And like some other planners in her network and elsewhere, she’ll work for an hourly fee.